The wet season is now pretty much over and the dolphin watching season has begun. Whilst the most commonly sighted species found near Kuching is the Irrawaddy dolphin there seem to be more and more sightings of finless porpoises. I guess this has something to do with the fact there are more boats going out dolphin watching and more people are aware that dolphins are found near Kuching. 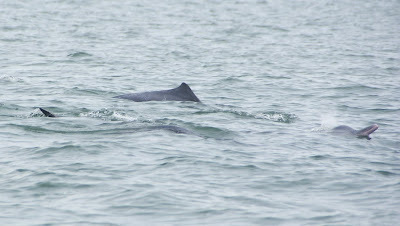 Another species that is occasionally spotted in the waters near Kuching is the Indo-pacific humpback dolphin. I haven’t had much luck with this species over the years and have only spotted them a couple of times near Santubong but they were way off in the distance. Others have had better luck. James, who spends most of his time exploring caves in Bau and Serian and running his Kuching Caving tour outfit, took the above photo last year. And James’ friend George has posted some excellent photos of Indo-pacific humpback dolphins taken at both Bako and Santubong on his website.